Members of the Webster faculty are invited to submit proposals for Short-term Faculty-Led Study Abroad programs for Fall or Winter break 2019. Applications will open on Sept. 1, with a deadline of Oct. 15. 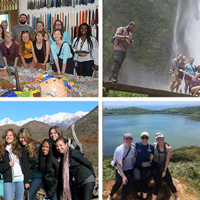 Short-term Faculty-led Study Abroad programs are credit-bearing and have an embedded travel component that highlights and supports the course learning objectives. All programs must be led by a Webster faculty. The format may include, but is not limited to, global hybrid format (an online course with travel component), condensed on-location courses, and other approved structures. The courses are typically less than six weeks of travel and may occur in any location around the world. See some recent examples of such programs in this story. For faculty interested in this round of applications or applying in the future, information sessions on proposing and developing short-term programs will be held via WebEx on Wednesday, Sept. 12, 10-11 a.m. (CDT) and Friday, Sept. 21, 1-2 p.m. (CDT). Please RSVP here. All questions should be directed to Hannah Verity, director of Global Program Development at 314.246.7627 or hannahverity72@webster.edu.